Hands down the best stimulant free pre-workout product on the market. When we set out to formulate this new product, we wanted to make sure we were putting out the best pre-workout products possible. We solicited a lot of help from our customers and spent countless hour researching the ingredients. The product we have put together packs such a punch that we almost called it “The Bomb.” Each serving weighs about 21 grams, so you can be sure you are getting plenty of the ingredients you need to get the most from your workout efforts. So, what is in this new pre workout and why is it so great? 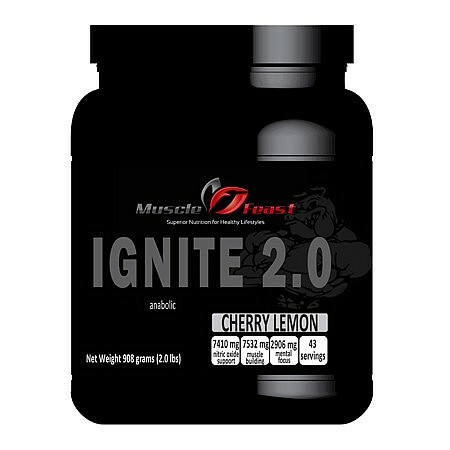 This product has ingredients to help with three essential areas needed for a great pre-workout; Nitric Oxide Support, Muscle Building, and Mental Focus. Nitric Oxide Support Agmtatine: Probably the best overal vasodialator in the market right now is Agmatine. Creatine nitrate is also good but has a few disadvantages (can be tough on the stomach, people build up a tolerance to it, and it reacts with other ingredients in the container as most of you know that are familiar with our original Ignite product). Unlike creatine nitrate, Agmatine is much better tolerated, provides about the same level of vasodialtion and people that have been taking it for several years continue to get the same levels of vascularity and pumps as they did when they first started taking it. Agmatine is also known for helping with LH and GH levels, especially at dosage levels in the 2-3g range per day. Agmatine is also a strong anti-oxidant has many other benefits related to better blood flow. For our agmatine, we chose to use the purest form available; Agmapure. Agmapure is a patented form of agmatine that is much more pure and free of the harsh sulfur tastes associated with less pure forms of agmatine. Why Muscle Feast, LLC? We guarantee our supplements to be the freshest and purest available: Muscle Feast, LLC supplements are manufactured under the strictest HACCP, FDA, and Kosher standards, producing the highest quality and purest supplements available. Our raw ingredients undergo state of the art analysis to ensure zero impurities and strict adherence to product labeling. When it comes to price and quality you can’t beat Muscle Feast. We guarantee it! Important facts you should know about our supplements: * Laboratory tested for purity * Strict adherence to GmP, HACCP and Kosher standards * Licensed and regularly inspected by The Ohio Department of Agriculture * Freshly manufactured – not expired or closeout * Spoon mixes with no gritty taste or residue * Backed by the Muscle Feast 30-day money back guarantee FREE dosing scoop: Get the exact dosage every time with a free scoop.